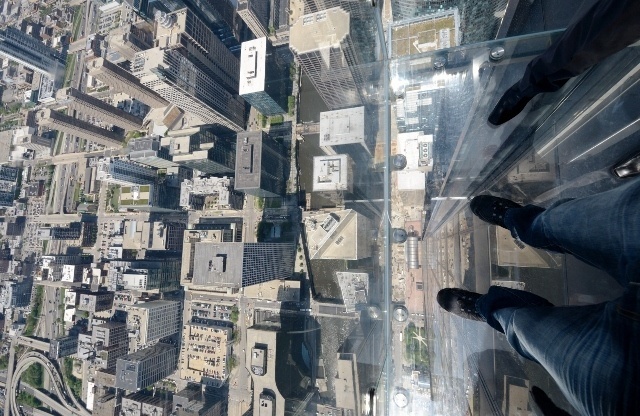 Chicago coverage continues…The Sears Tower (which they have conspicuously failed to rename the Willis Tower) offers four of these glass boxes that stick out four feet into nothingness some 1450 feet over the ground. The ultimate in aversion therapy for vertigo sufferers and highly entertaining for all of us. locals (myself included) still refer to it as the sears, but young tourists from elsewhere not familiar w/ the building have probably been indoctrinated by the signage/guards/etc. how could you have possibly missed them?